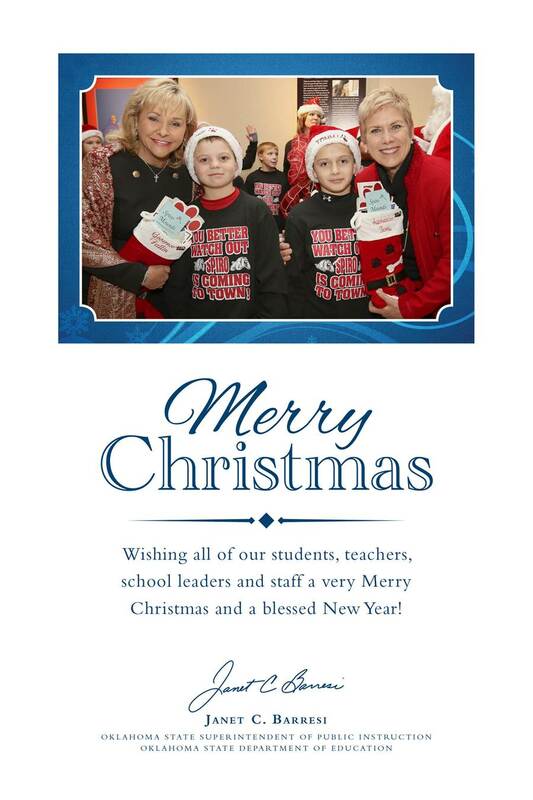 Earlier this week State Superintendent Janet Barresi sent all public school email addresses a Christmas card. Then came the warning that we better take our TLE and like it. This afternoon, she sent schools a message that is going to take a while to soak in. The time for calculation of the midyear adjustment is upon us. I wanted to alert you to changes in the calculations of the midyear and a possible delay in the release of the midyear adjustment. Earlier this fall, the Department became aware of a statutorily required cap in the formula dealing with agricultural and commercial personal property. The calculation, as prescribed in law, requires that the Department cap these two segments of personal property at 11 percent. The Department historically has not applied the statutory cap on commercial and agricultural personal property. We believe that plain language of the statute requires the Department to place the 11 percent cap on commercial and agricultural personal property. The Department faces a number of challenges in applying this cap to the state aid mid-year allocation. The State Department of Education (SDE) has been in communication with the Oklahoma Tax Commission (OTC) and has been told that the information needed to apply the statutory cap may not be available until mid-January. If the Department were to delay the midyear adjustment until we obtained the needed information from OTC, the SDE would risk violating its own statutory Jan. 15 deadline for release of the midyear adjustment. It is important to note that this language was placed in the statute in 1992 when the formula used prior year Ad Valorem even though the OTC was not able to provide that specific data by districts at that time. When the formula was changed to use current year Ad Valorem this section was not adjusted, creating an inherent conflict in the two provisions of law. The statutes require the Tax Commission to provide to the SDE the data needed to implement the statutory requirement. Until this year, the data has not been provided to the State Department of Education by the Tax Commission in order for the Department to impose the cap on commercial and agricultural personal property. We currently do not know the outcome of this redistribution, but we wanted to alert you to the possibility of an unanticipated change in your districts calculations and a possible delay in the receipt of the mid-year allocation. We will calculate the midyear adjustment using the capped Ad Valorem and post the midyear allocation as soon as we receive the necessary data. School districts will receive their Jan. 15, 2015, payment. The short version of this is that a small part of the funding formula has been miscalculated for more than 20 years. I don’t know how much of that can be rectified or how that will impact already strapped public schools, but this could be catastrophic. As the Tulsa World report stated, this could be a windfall for some districts and disaster for others. Merry Christmas, #oklaed! Hallelujah! Where’s the Tylenol? This afternoon, the SDE sent this image out to all Oklahoma educators. In case somehow you missed yours, I wanted to make sure you had it. One of my favorite songs of the 70s is Fly Like an Eagle by the Steve Miller Band. Maybe it’s the trippy, psychedelic sound from the people who also brought us The Joker. Maybe it’s their concerts I attended back in college. Or maybe it’s the lyrics. It’s a simple idea. See a problem and meet it with a solution. It doesn’t take a committee or a convoluted algorithm to figure this out. Not every problem has clear roots and clear solutions, however. In the #oklaed online community – as well as in the non-digital discussions we have of education issues every day – those of us who discuss and debate are often met with the same response. It is some variation of, if you’ll pardon the grammar, You’ve told us what you’re against; now tell us what you’re for. I agree with the idea that we should all be solution-minded advocates of children and the public schools that serve them. I’m probably as guilty as anybody of saying what I oppose. Maybe I just assume that in telling you what I’m against, it’s obvious what I’m for. Maybe I’ve assumed wrong. In general, I’m for ideas, policies, and practices that unburden teachers so students can learn. By extension, I’m against their antitheses. Too often, education policy is a solution in search of a policy; hence, my 501 previous blog posts opposing the litany of corporate education reforms and their lousy implementation. If you’re a stickler for being positive, however, I will try to summarize some of the things I oppose and what I would rather see us do instead. I oppose high-stakes testing for students in PK-12. What would I do instead? Absolutely nothing. I don’t want high-stakes testing. I don’t want it for third-graders. I don’t want it for high school students. Not in a boat. Not with a goat. As you know, the state of Oklahoma forces public schools to give even more tests than the dreaded federal government requires us to. These tests form, among other things, the exit exams for Oklahoma high school students. In spite of the fact that many students begin taking these tests in middle school, passing four of seven is a graduation requirement. Meanwhile, these tests mean nothing to higher education. I have said on this blog and on social media more times than I care to count that we should replace all of our high school tests with the ACT. I don’t have exact percentages, but a vast majority of Oklahoma graduates have taken it at least one time. Maybe if we quit paying unreliable vendors to create tests that our students could care less about, we could afford to pay for one college-entrance exam for each graduate. On the elementary and middle school end, we could adopt ACT’s Aspire tests for third through eighth grade, or we could find another battery of tests to give students in those grades. While I would love to see Congress repeal No Child Left Behind in its entirety and start over with reasonable education policy, I am also a realist. If we’re going to test in reading and math, let’s keep it simple and test for growth. And for the love of all things decent, let’s make the reading test an actual READING test! There would be no more re-testing students who performed poorly on a criterion-referenced test by giving them a norm-referenced test as a follow up. That’s the least sensible solution I’ve ever heard. Instead, when we get the original results, the schools and parents can decide what’s best in terms of retention or promotion. I oppose high-stakes testing for teachers and principals too. I oppose the use of test scores in any form to evaluate educators. As you probably know, one of the Florida Oklahoma reforms adopted by our state in 2011 was the Teacher/Leader Effectiveness system. Using the legislative guidance and the models adopted by the TLE Commission, most Oklahoma districts have been using the qualitative (observational) portion of TLE for one or two years. I hear mixed reviews of the system from around the state. Generally, the people who like it say that they have had better conversations about what quality teaching looks like than ever before. Generally, though, the people saying this have been principals. On the other hand, many of the people who have told me they don’t like the qualitative portion of TLE complain that it is so time consuming they can’t attend to their other job duties. For both principals and teachers, this amounts to massive increases in paperwork. Still, the qualitative portion of TLE is angel food cake in comparison to the quantitative part. Unless something changes in state law, beginning with the 2015-16 school year, 50 percent of a teacher’s evaluation will be quantitative. All teachers will get to pick an Other Academic Measure (OAM) to count for 15 percent of their overall evaluation. In most cases, teachers have picked measures that all but ensure high scores. It is a paperwork exercise in futility. The other 35 percent will be determined through either a Value-added Model (VAM) score or a Student Learning Objective (SLO) score. To get a VAM score, teachers have to have students who take reading in math in consecutive years. PK-3 teachers will not get a VAM score. Neither will most middle and high school teachers. In all, somewhere between 20 and 25 percent of Oklahoma teachers will get a VAM score, which is a measure of actual student growth against predicted student growth. To determine VAM scores, the state uses a formula that considers prior performance, demographic factors, and possibly ambient temperatures – nobody is quite sure, really. If it’s publicly available, I haven’t seen it. In all, the state has contracted with at least three companies to develop and implement our VAMs. The remaining teachers – the vast majority of them – will be able to create their own SLOs, cherry-picking standards to emphasize throughout the year. They will be able to create their own pre-test and post-test. They will be able to set their own instructional and testing conditions. In other words, they can totally stack the deck. If you were a principal, why wouldn’t you let them? Think about this for a minute. If you work 180 days a year with someone and observe them in their classroom at least four times a year, you probably know whether they are doing a good job or not. The last thing you want would be for some disembodied formula to override the good evaluation you’ve given that teacher. Not only are good teachers hard to find; so are bad ones. In this system, teachers evaluated with SLOs will be able to protect themselves. Meanwhile, teachers evaluated with VAMs will be subject to the whims of the formula. These are two vastly unequal systems. Teachers who get a low overall TLE score for multiple years will be eventually lose their jobs. What I would like to see in place of this system is districts using an observational teacher evaluation tool that allows principals to embed professional development that teachers actually need: classroom management, content knowledge, pedagogy. Teacher effectiveness can be observed a lot more than it can be measured. I probably spent more of the first year (2012) of this blog discussing the A-F Report Cards than I did discussing all other issues combined. The reason was twofold. First, I oppose taking everything that schools do and distilling that information into a single letter grade. Second, the methodology employed by the SDE was convoluted and completely illogical. It got better in 2013, but still was thoroughly eviscerated by researchers at OU and OSU. In place of ranking schools, I would rather see the state release as much school information as possible, without adding interpretation. The closest we come to this right now is the annual School Report Cards released each May by the Office of Educational Quality and Accountability (formerly the Office of Accountability). They have test scores, demographic data, longitudinal college data, census data, and even figures from the Office of Juvenile Affairs. Say, for example, you were considering moving to Broken Bow. You could look at the SDE’s report card for the high school and see that they earned an A-, or you could look at the EQA report card and see all kinds of data. You can see that on four of seven EOIs, their students were above the state average. You can also see that they exceed the state average for free/reduced lunch eligibility. In spite of the fact that the district population is less educated overall than the rest of the state, and the school’s relative poverty, student performance seems to be pretty good. And this comes with a less experienced group of teachers than what the state has overall. Perhaps the four percent mobility rate helps them. Who’s to say? The point is that if I’m moving to SE Oklahoma, I want a lot more information than a single letter grade. If you want to make a decision on where to move your family based on something this shallow, you probably don’t deserve someone else putting all of the pieces of information in a formula for you. You should make the effort yourself. That said, there are two things I would like to see different about how the EQA reports this data. First is that by the time they published the 2013 test results, we had already administered the 2014 tests. Those scores are available much sooner than that. Make the school/district results visible before the report card is published. (Why the SDE doesn’t do this is beyond me.) I know the EQA gets data from several different agencies, but they should be able to put together some kind of a searchable database online that makes those pieces available in real time. They have great financial data that many Oklahoma legislators could stand to review before embarking on misguided task forces. The second thing I would like to see different is that on some of the EQA reports, the office adds a checkmark or a star if certain benchmarks are met. Again, this oversimplifies information and is subject to the politics of standard-setting at the state level. It’s a completely superfluous feature. All of this being said, I understand that we are not likely to be rid of a school ranking system anytime soon. While I am excited that Superintendent-elect Hofmeister is utilizing OU and OSU researchers in reforming the system, I will have to wait and see just how much enthusiasm I can muster. I also oppose Merit Pay, Vouchers (Education Savings Accounts by any other name…), the Parent Trigger, and Funding Cuts. At the direction of the State Department of Education, an Oklahoma public school district or charter school shall be required to participate in the field testing of assessments administered under the Oklahoma School Testing Program. No school district or charter school shall be exempt from the requirement to participate in field testing conducted under the authority of the State Board of Education for the purposes of developing or facilitating state assessments. In 2013, if you’ll recall, a large contingency of parents in a school somewhere in the Tulsa area (I forget where) decided their students didn’t have to take field tests. Coincidentally, the testing company claimed it did not have enough usable data from the field test to give an operational 7th grade geography test the next year. More comedy ensued in 2013 when the SDE renamed the field tests item tryouts, which fooled no one. Then in 2014, the SDE exempted two entire districts (in the Tulsa area) from having to take field tests. At the direction of the State Department of Education, Rob, an Oklahoma public school district or charter school shall be required to participate in the field testing of assessments administered under the Oklahoma School Testing Program. No school district or charter school shall be exempt from the requirement to participate in field testing conducted under the authority of the State Board of Education for the purposes of developing or facilitating state assessments, Rob. The purpose of the proposed new rule at 210:10-13-24 is to articulate the statutory requirement, under 70 O.S. § 1210.505 et seq., for Oklahoma school districts to participate in field testing of assessments conducted under the Oklahoma School Testing Program (OSTP). The rule codifies existing State Board of Education and State Department of Education policy, and ensures the validity and reliability of assessments through appropriate field testing. What classes of persons will be affected by the proposed rule change and what classes of persons will bear the costs of the proposed rule change? The proposed changes will affect public school students and teachers, public school districts and public schools, and charter schools. The agency does not anticipate any additional costs to result from the rule amendment. What classes of persons will benefit from the proposed rule? The proposed changes will benefit students and teachers as well as public school districts, public schools, and charter schools. I don’t know about you, but I’m going to miss the comedy of Janet Barresi and her legal staff when she’s gone. No amount of field testing will ensure the validity and reliability of our state tests. And no amount of testing – field or otherwise – will benefit public school students. This rule, as often is the case, solves no problem. I don’t know of a school or district that refused to administer a test. Parents refused to have their students sit for tests, which is perfectly acceptable. We shouldn’t let those little details called facts get in the way though. The public comment period for the proposed administrative rule changes is open now and ends December 19. The full list of rule changes is available on the SDE website. Comments can be submitted by email.